Musta mga wuhan? Di ba china made parang stagg. Sabi sa net b20 hand hammered. They are extremely cheap though. They look it too. Nice! Sige hanap ako kung san meron to try it out. Na-curious ako sa sabian. Wala ba talagang local showroom that stocks those? Independent sellers? Yung isinuggest kong 13" Fusion hats. Kaso nakabili kana pala hihi. Di ko sure kung active pa si sir JP dito ng Yupangco. Ang alam ko kasi pag may special Request ka ng Sabian matutulungan ka nya. the wuhans are inconsistent. though b20 bronze siya, some may sound bad, while others may sound sweet. hand hammered eh. IMHO, Stagg is better than Wuhan. Ay talaga? Parang kailan lang nag inquire ako ng Studio Crash sa kanya. JP BUDUAN ba? wala na papsi. buhay MMA na siya ngayon hahaha. Ano nangyare? As in wala na siya dun? Seriously? Ay sayang naman. Dami pa naman niya natulungan na ka PM dito regarding items. Jp who used to work for yupangco? May naalala ako dati na jp who did tech for bea lao sa gig namin dati sa saguijo. Used to be in a metalcore band with bea, doin slipknot & killswitch engage covers. Mma na pala siya. 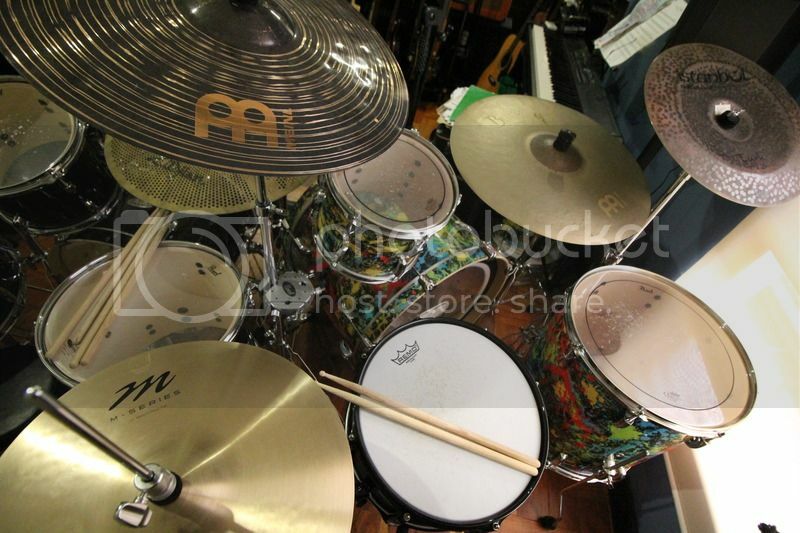 Paiste PST 5 Uni set, Paiste PST 7 Uni set and Paiste PST 8 rock. mura lang ang mga yan. thanks sa tip sir. will check those out! got these last weekend! now i understand the nuances of stick technique. of all my hats this one is what i would call versatile! very aggressive when bashed, but cleans up very, very nicely. mukhang matututo ako ng stick response and dynamics dito! 13" m series medium hi hats! awesome bro! experiment din with different stick tips. personally, I like the jazz/round tips better than the normal bean/oval shape. think i got the rounded tips. eto yun naka-sale sa jb na walang tatak pero name brand daw. smaller than my old 9a which i started on. found the 5 too big kasi. i also get the unmarked sticks from audiophile. ganun din daw yun, unmarked over runs from some name brand. basta binibili ko yun pinakamura lagi. but i never break sticks ever. oi ano yang unmarked sticks na yan sa audiophile? how mats? :O lyric Vic Firth 9+1 ako lagi, kaso lately ampapanget na nung finish, sobrang bako bako na. Sabi nung sales sa festi, promark daw na un labelled. I usually just choose a pair based on weight. Yun sa jb, parang vic firth yata. Not sure. Basta mura, and pretty good too. 8a hickory pala yun gamit ko dati, yun lazer na brand. Pretty good actually. My zildjian 5's never get any use at all. 8a hickory ni lazer sobrang favorite ko! yan yung definition ko ng perfect stick! round tip and a good taper. tska amtibay! Yup! Still have mine. A bit scuffed but still usable. Wrong spelling pa nga eh. MUSICAL INSTRUNENTS! Long story short, I went home with both! Hahaha! Di na muna ako lalabas ng bahay. tol, on another note, ampunin mo anlang ako pls HAHAHAHAHA lets jam if you're free! Hahaha! Puede pero bass ako. Whats a good crash in between my 16" extra dry thin byzance & 19 classics custom dark? Only have budget for istanbul. Parang gusto ko ng traditional, radiant sweet, samatya or that funky one with the black bell! Bad Behavior has blocked 77846 access attempts in the last 7 days.